Turning off Find My iPhone is quite easy when you know the password because it’s a matter of simply visiting the iCloud section of the Settings app, providing the password, and disabling it. However, if you don’t remember the password then you will need to take a different approach， this guide will tell you how to turn off find my iPhone without password iOS 12. Tip: What is Find My iPhone? Should I Disable it? This is technically a loophole that you can take advantage of in order to turn off Find My iPhone without password iOS 12. The process is quite simple. Step 1: Open Settings app on your iOS 12 iPhone. Step 2: Navigate to iCloud. You will be asked to input your password. Simply input any random number and tap on Done. Step 3: Once you input a random number, you will be notified that the password is not correct. Tap on OK and then select the Cancel option. Once you do this, the iCloud section will reopen. Step 4: Now press Account and erase the Description. You will see the main iCloud section once again and Find My iPhone feature will be automatically turned off. Since resetting password is quite easy, it is recommended that you reset your password and then turn off Find My iPhone conveniently. 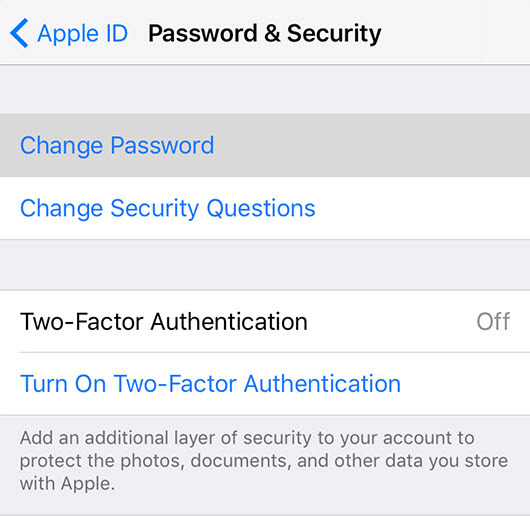 There are 3 ways to reset the Apple ID password: resetting via email, password, and security questions, resetting via two-factor authentication, and resetting via two-step verification. Resetting password via two-factor authentication is the easiest and quickest method. Step 1: On your iOS 12 iPhone, launch Settings app and navigate to [your name] > Password & Security. Step 2: Now find and tap on Change Password option. After that, follow the on-screen instructions to change your password. Once you have disabled Find My iPhone, you can proceed to reset your iOS 12 iPhone. Standard methods of resetting an iPhone work well but they don’t erase data permanently which could be a huge privacy risk because the deleted data can be recovered via a data recovery software. That’s why it is recommended that you use iMyFone Umate Pro for Win or for Mac to completely reset your iPhone. 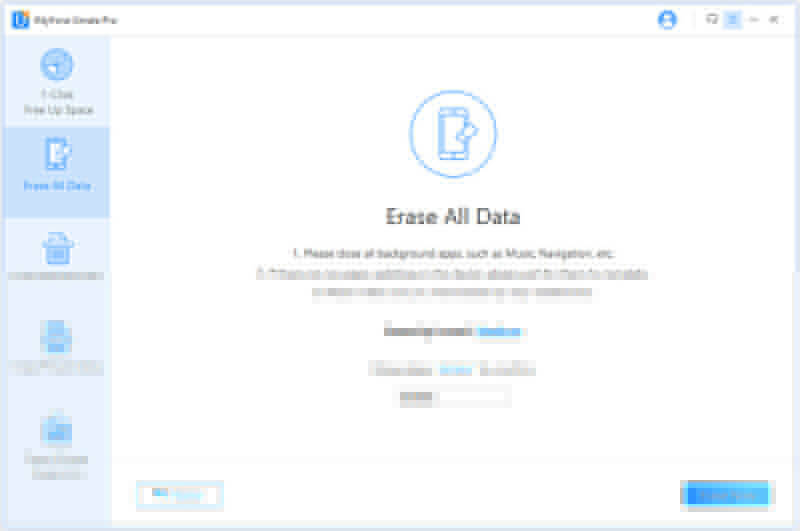 Umate Pro erases data permanently so when you reset your iPhone via this software, you can rest easy knowing that the erased data will not get recovered by any data recovery software and your privacy will remain protected. Erase any type of data from your iDevice permanently. 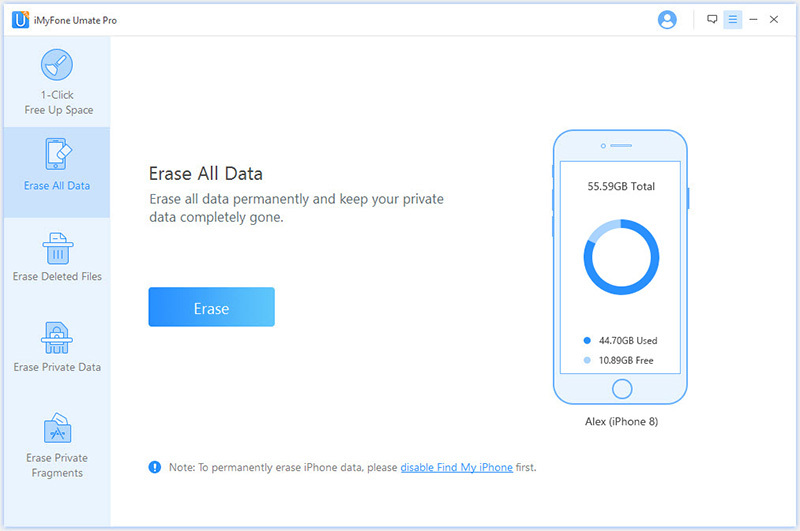 Permanently erase private iPhone data such as photos, videos, music, notes, contacts, call history, messages, etc. Umate Pro can erase previously deleted files from your iPhone to make them unrecoverable. Completely reset your iPhone with a single click via Erase All Data mode. Boost your iPhone’s performance via 1-Click Free Up Space mode. Step 1: Connect your iPhone to your computer via lightning or USB cable. Step 2: Launch Umate Pro and click on Erase All Data mode. Step 3: One the next page, click on the Erase button to proceed. Step 4: Now you will need to select a Security Level of deletion. Choose from Low, Medium, and High. Step 5: Next, input the word ‘delete’ in the textbox that is shown on the same screen. Step 6: Click on the Erase Now button to start the data deletion process. What is Find My iPhone? Should I Disable it? Find My iPhone is a very useful feature from Apple that is designed to locate and protect your iDevice in case it is ever stolen or lost. Locate your or your family members’ iDevices on the map. Find your iDevice by playing a sound on it. Lock and track your iDevice by using Lost Mode. 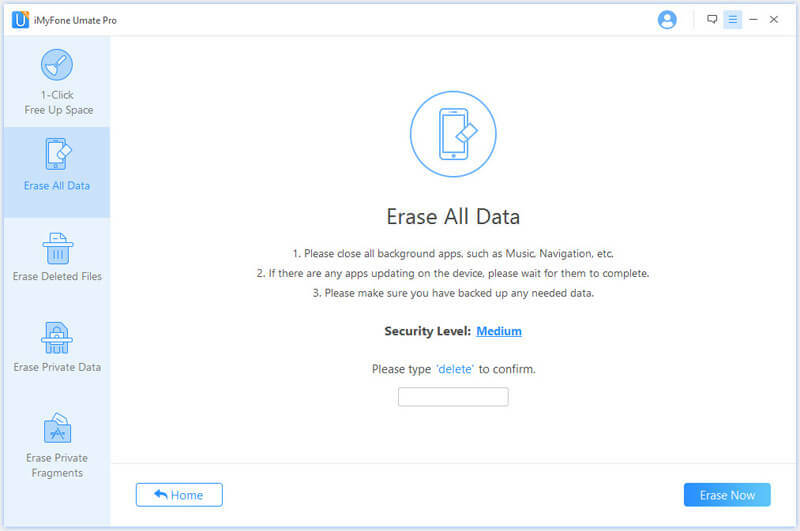 Remotely erase your iDevice’s data. Use Activation Lock to protect your iDevice. Because of these useful benefits, you should have Find My iPhone feature turned on. However, you will need to disable it when you want to erase your iPhone. Find My iPhone is a useful feature that should be turned on so that you can track, lock, and erase your iDevice if its ever lost or stolen. However, you may need to disable it in order to erase your iDevice or some other purposes. Disabling Find My iPhone without the password can be a challenge but you can disable it by erasing your iCloud’s account description or resetting your password first and then disabling it. After disabling Find My iPhone, it is recommended that you use iMyFone Umate Pro to completely reset your iPhone so that there are no risks of privacy leak after the reset.